Assistant professor, School of Applied Science, Banasthali University, Rajasthan, India. About the 80 percent part of the world is covered by the water, they are with the large oceans and the seas, in them lies the photosynthetic algae, they are present about the depth of the 160 meters, it depends on the water nature and about its pollution level. Algae occur in the shores and coast, the bottom attached with any basic body (benthic algae) and some time they follow on the water by the free-living activity these are the plank tonic organism. Fresh water of the body like the ponds and the lakes and the rivers are also attached by the many kinds of the forms of the algae, and many of the species of the algae are also the terrestrial form. Algae accounts for the half of the primary production of the photosynthesis. About all the aquatic organism depends on the algae for their primary production and the water biogeochemical cycles are the result of the algae production, they are the primary producers. Algae are very valuable ecologically as well as the phylogenetically. This is the reasons in the sea one can finds the major evolutionary lineages in the oceans and in the sea. For the tracing, out the evolution of the plant world and the animals we have to understand the evolution and the phylogeny of the algae. Algae are often termed as the lower plants; they are the first photosynthetic plants which palsy a key role in the ecosystem. They have all range of the characters from the blue green to the red algae. The life cycle pattern varies from the diplontic, heteromprphic diplohapliontic, isomorphic diplohaplontic, haplontic. in some case there is only one kinds of the life cycles pattern visible however in some of the algal classes a variation and several kinds of the life cycle pattern can be seen or visible [1-3]. Chlorophyta is the class which are commonly known as the green algae, they have the isokont kinds of the flagella pattern and the photosynthetic pigments of the chlorophyaceae are the CHL a and the b. In addition to that there several kinds of the pigment exit these are the xanthophyllls and types of the xanthophylls modifications. Chlorophyacae has a number of the characters and the range of the characters with variations. Chlorophyta has been divided by the Hoek, Manns, Jahns divided the whole of the division in to the 11 classes [4-6]. 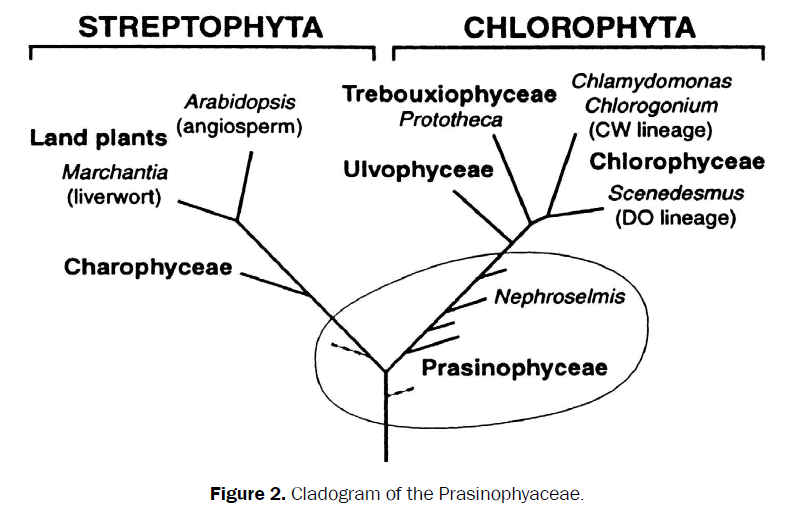 Here in this review articles we are working on the some of the aspects of the one of the primitive class of the chlorophyta entitled as the Prasinophyaceae. Prasinophyaceae are the earliest diverging modern green algae, the meaning of the prasinos is the green. In some of the literature they have been termed as the micormoanodophyes [10,11]. This line of the evolution is the monophylietic and they involve the seven clades. Prasinophyacae are the combination of the rare and the unique features. The fossil history of the prasinophyacae goes back to the Cambrian period. Some of the features of the prasinophyacae are as follows [7-9]. 1) The members of the Prasinophyacae are the free-living flagellate green algae. 2) The cell body and the flagella are covered by the several layers the scales or the types or armour of the scales. 3) The cells bear the 1-8 flagella and they are either apically or laterally insert. 4) The flagella of the cells arise from the bases of the very significant types of the depression body of the cell. 5) The structure and morphology of the flagella root system varies from the simple to the complex kinds of the structure. They have distinct rhizoplast, and unusual basal bodies. 6) Mitosis and the cytokinesis vary with in the classes. Mitosis is open or closed, with or without persistent telophase spindle. 7) The majority of the members of the Prasinophyacae occur in the marine and the fresh waters. In the whole class about the 16 genera’s and the 180 species are present. They occur in the marine, brackish and the freshwater habitat [10,11]. Minute amount of the prasinophyacae occurs in the genus Bathycocus, ranges from 6 to few micrometers. They are generally found in the euphotic zones of the plankton zones of the oceans and the sea. These organisms together form the coccoid cynophytes, prochloprhytes, heterokontophytes, haptophytes. They contribute the primary oceanic productions. These algae form the large cyst like structures, 100-800 micrometers. These cysts have been termed as the phycometa. These structures have the thick walls composed of the two layers. Outer layers are resistant to the microbial degradation and they have been found in the fossil depositions. Prasinophyacae known to have as the photosynthetic endosymbionts in many heterotrophic organisms. Tetraselmis convolutae is the endosymbiont of the intertidal turbellarian worm convolute roscoeffensis [10,11]. In many radiolarians tiny kinds of the Prasinophyaceans have been reported. In some of the dinoflagellates like the Noctiluca an endosymbiotic prasinophyacens have been reported (Figures 1 and 2). Figure 2. Cladogram of the Prasinophyaceae. Because the prasinphyaceae are the unicellular, majority of the variations of the prasinophyacae are based on the ultrastructures details of the genera’s. Prasinophyaceae cells contains the large Golgi bodies which lies between the nucleus and the flagella, and forms the main part of the cysts . Flagella of the prasinohpyaceae: The flagella of the prasinopnyacae arises from the apical depression or pit of the flagellar basal bodies. 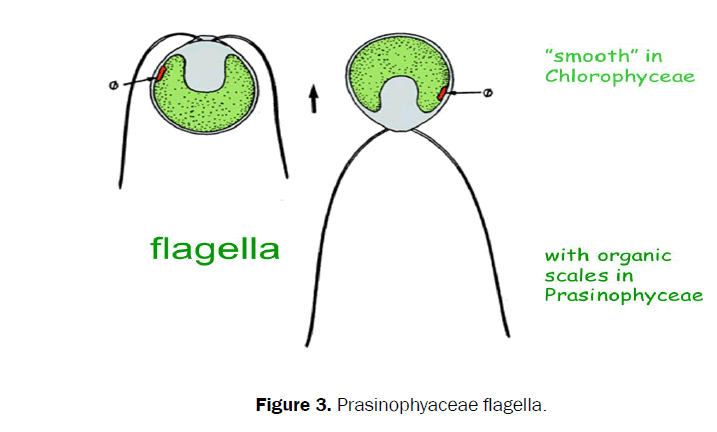 The numbers of the flagella arise from the one in Pedionomids, the flagellar transition region is generally uniform in the majority of the classes but in the prasinophyacae they have the large variations. Three major transition region occurs in the Prasinophyacae one is the stellate structures or the helix, the contractile protein centrin (Figure 3). Phylogeny of the prasinophyacae However with the recent studies it has been concluded that the prasinohpyace are the unnatural assemblages of the genus. So, they are the paraphyletic in origin. Present cladograowards the very successful land habitats is presented by the silar and Leliaert. These members are generally evolutionary primitive they have the less developed organs and the other parts. some of the organelles are generative and they represent the evolution of the organ, endosymbiotic nature shows the early divergences of the lines of the evolution in different lines of algal groups (Figure 4). Figure 4. 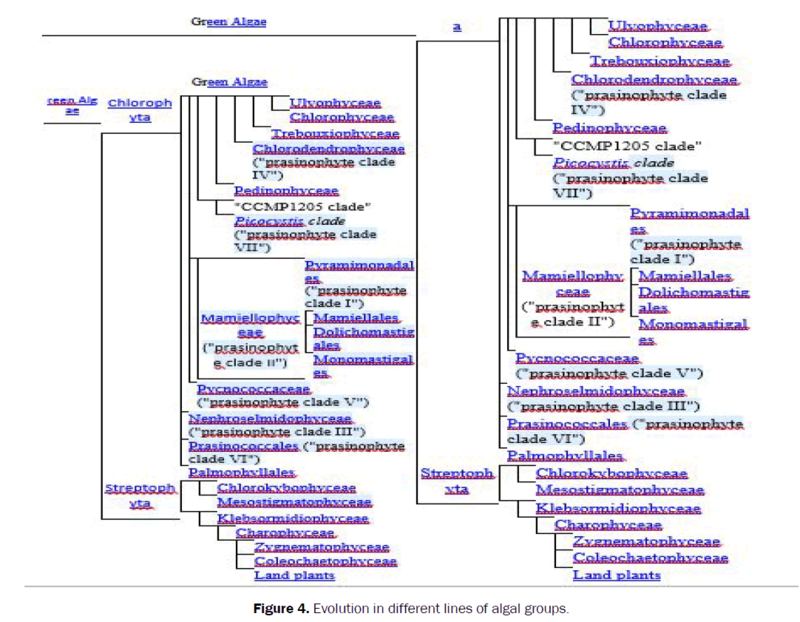 Evolution in different lines of algal groups. This is the mini review of the class Prasinophyacae. 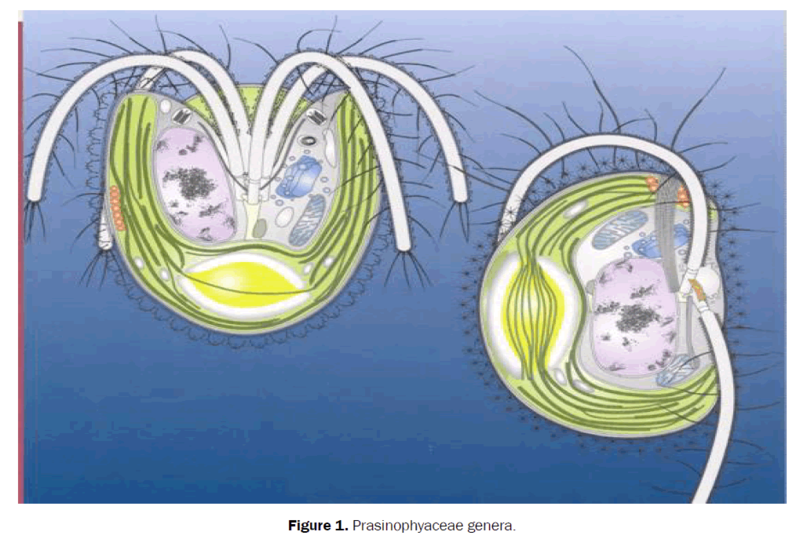 This article represents the overall some of the points of the class and its features, this is informative for the students of the algae worker as well as the lineages. Leliaert. Chloroplast phylogenomic analyses reveal the deepest-branching lineage of the Chlorophyta, Palmophyllophyceae class. Nov Sci Rep. 2016;6(1). Vaulot D, et al. A single species, Micromonas pusilla (Prasinophyceae), dominates the eukaryotic Picoplankton in the Western English Channel. Appl Environ Microbiol. 2004;70(7):4064–4072. Satjarak A, et al. Genome-wide analysis of carbohydrate-active enzymes in Pyramimonas parkeae (Prasinophyceae). J Phycol 2017;53(5):1072-1086. Philippe S. Protistes Eucaryotes: Origine, Evolution et Biologie des Microbes Eucaryotes. HAL archives-ouvertes. 2016;1-462. Hoek C, et al. Algae an introduction to phycology. Cambridge University Press, Cambridge, UK. 1995.